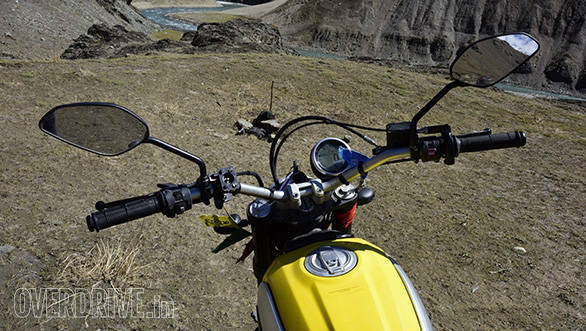 So we've just come back from caning the Ducati Scrambler through the Himalayas. Rough roads, bad roads, no roads and some racetrack smooth tarmac. The Himalayas never cease to amaze. What also amazed is the Scrambler Icon. But it does have a few chinks in the armour. First impressions are the most important they say. If that is true, the Scrambler has got it all figured out. It is a design that is a flawless interpretation of the Scramblers of yore. 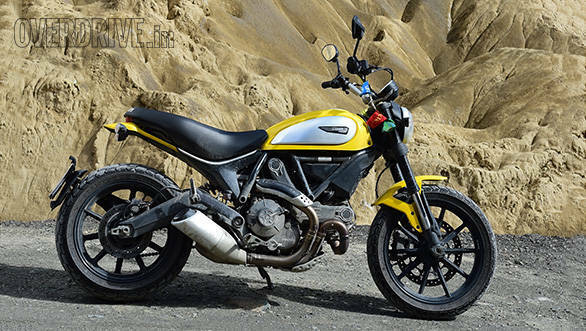 But aside from that, what is interesting is that unlike the other Scrambler available internationally, the Ducati doesn't seem like a Frankenstein job. It is a motorcycle that has been engineered from scratch to look and feel the way it does. Everything ticks both the form and function check-boxes  high handlebars, on/off-road tyres, a flat seat that lets you slide around. Oh, and that yellow colour is the bomb! 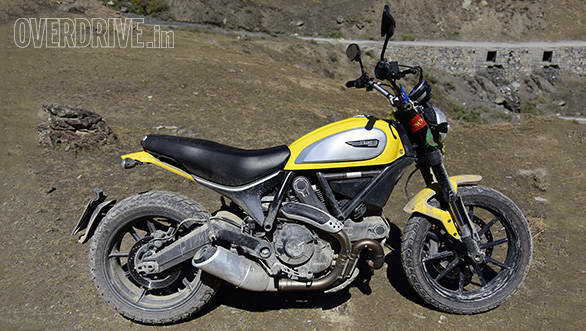 The Scrambler has to be the friendliest Ducati that you can get your hands on. I've always found the Ducatis to be motorcycles that require a lot of work to ride. They are all the more rewarding for it, but they're a lot of work nonetheless. But not this Scrambler. The moment you start riding it, you realise how intuitive and effortless the handling is. You do not have to hang off the sides or shift your weight. Just sit upright and countersteer your way around that twisty stretch of tarmac. For the two weeks that I spent with it (well, almost), there was not one moment when I felt that I've pushed the motorcycle too far. It is forgiving without losing any sharpness that makes it such a joy to ride on the twisties. Scramblers were always made to be fun off the road and I must say that I absolutely love the way this Ducati handles off-road. The suspension is set up for street riding, so there isn't a lot of travel and is a lot stiffer than what would be perfect for off-road riding. But that is not to say that the suspension is so hard that it is impossible to ride off-road. Your arms do take a bit of beating, but once you put that out of your mind, you realise that everything on this motorcycle has been designed to work when you're caning it off-road. The handlebars are high enough that when you're standing up and riding, the controls aren't too far away. The tank is slim enough to be easy to grab with your knees. The top of the tank and the seat make for a nice flat surface that when you need to slide ahead and put some weight on the front end, you can, without having your tenders squished by a large tank. There is oodles of grip provided by the Pirelli MT-06s and you're never at a loss for traction on any surface. And since the motorcycle is high enough anyway, there isn't any worry of damaging your sump while riding off-road. And in case you still worry, there is that optional sump guard that can be fitted. You would think that a single disc up front is a strange sight on a Ducati. But it really isn't. And certainly not when that Brembo calliper delivers so much braking force that you hardly ever have to touch your rear brake except for when you want to slide your tail out. But, ABS. The Ducati has one of the most unintrusive ABS systems that I have come across. On our 3,000km ride, it hardly ever engaged. It did cut in on the dirt sometimes, but that too was so few times that it doesn't really matter. As long as you're gentle, progressive and not a monkey about it. Plus, if you really want to do silly things with your brakes, then you can always switch the thingamajig completely off. It took me a while to figure this out, but when I eventually did, I felt like an idiot for trying to fit a battery pack into my handlebar cellphone mount. The Scrambler gets a handy little USB charge socket under its seat. The wire is especially long for when you need your phone GPS running throughout the trip. Especially in the 62 Yellow shade, the Scrambler attracts so much attention. Everybody wants to know what it is, look at it, touch it, feel it and sit on it. You feel all special and nice at first, but it'll soon become irritating. Of course that is the case with most big bikes in our country, but the Bonnie, for example, can slip by unnoticed almost all the time. This a problem I've had with a lot of big nakeds. Well, the Scrambler might not be all that big, but it is big enough to be a bother. Anything over 120 and your neck will be straining with the amount of wind that is attacking you. It isn't something that is a major cause of worry, but is quite annoying when you're in the mood to go fast.